Why put all the pressure of brainstorming viral marketing ideas on your own shoulders when you may have other marketers to help you out? Each member of your marketing team is working towards the same goal and each one may bring something unique and valuable to the table. Give this method a shot and see what your team can come up with. Not only will you get one or more viral marketing ideas, but you’ll oftentimes be surprised at your team’s inventiveness and desire to succeed. Really make the activity fun and reward the person who comes up with the best ideas by giving them honorable mention in the company newsletter or via some other means. Make the reward good. After all, that person may have helped you reach the viral marketing success that you’re after. Nothing causes prospects and customers to pay attention quite like a contest where they have a chance to win free stuff. When you get your prospects and customers involved in brainstorming viral marketing ideas, you’ll typically get wildly new ideas and perspectives that you – nor any of your team members -ever considered before. You might even offer to mention the prospect or customer that comes up with the bets viral marketing idea in the actual video or campaign piece that you plan to publish. That’s a great way to sweeten the deal and it should bring in far more great viral marketing ideas that are worth considering. Many viral marketing campaigns are based on current events. You might skim the news to look for relevant trends or topics that you can cover. You might take a celebrity news item and make a comedy video out of it; or you might choose to do a funny skit on a serious news item. As long as you don’t offend anyone and as long as you choose topics that are relevant to most people, you should come up with one or more viral marketing ideas. While a viral marketing campaign that is copied from another one is not likely to go anywhere, you might get a few ideas just by viewing a few of the current viral marketing ideas currently in publication. Funny videos like K-Mart’s current batch of dirty-sounding commercials, music videos like the Psy classic Gangnam Style or videos that make you think like any of the how-to videos currently on YouTube – really study these viral marketing ideas and find out what makes them different. What causes people to want to pass them around on social networks and on popular forms and via email? Sightline Studios ltd will help you embody your idea. While I mentioned previously that there are no tried and true methods for recreating the viral marketing experience, by viewing other viral marketing campaigns, you just might spark an idea that takes your business to the next level. Give it a try. What else do you have to lose? When brainstorming viral marketing ideas, even amongst your team or customers, you’re bound to come across those ideas that are outright discarded. These are those ideas that are so far out of the box that they don’t even belong in the same universe. Don’t throw these ideas away. Instead, put them aside until you’ve exhausted all other viral marketing ideas and you’re about ready to throw in the towel. This is when you’ll want to pull those ideas out and reconsider them. See if you can actually make them work. Oftentimes, it’s the outlandish ideas that catch the most viral fire. Make your crazy, wild and outlandish viral marketing ideas a reality and you might be surprised at how popular they become. Brainstorming viral marketing ideas is kind of like playing the lottery – you’ll never win if you don’t play. If you don’t consistently try to come up with new viral marketing ideas and you don’t consistently try to put those ideas into fruition, you’ll never reach your viral marketing goals. Only through continuous effort will you succeed. This is the one step that trips up most marketers. They feel as though they have to make that lightning strike and that if it doesn’t happen they should just give up. Marketing doesn’t work that way, especially online marketing. The Internet is constantly changing and so are your online prospects and customers. What’s hot and popular today might not be two weeks or months from now, and that goes for viral marketing ideas too. Keep brainstorming viral marketing ideas and get everyone involved – your team, customers and even your friends and relatives – and see if you can’t recreate that viral marketing success that all other marketers covet. Even though it might not happen the first or the first few hundred times, it only takes one good viral marketing idea to truly transform your business beyond recognition. Imagine scaling your business so much that you need to hire all new staff and expand into all new surroundings. Imagine putting your small business on the worldwide map with the ultimate video, info-graphic or white paper. 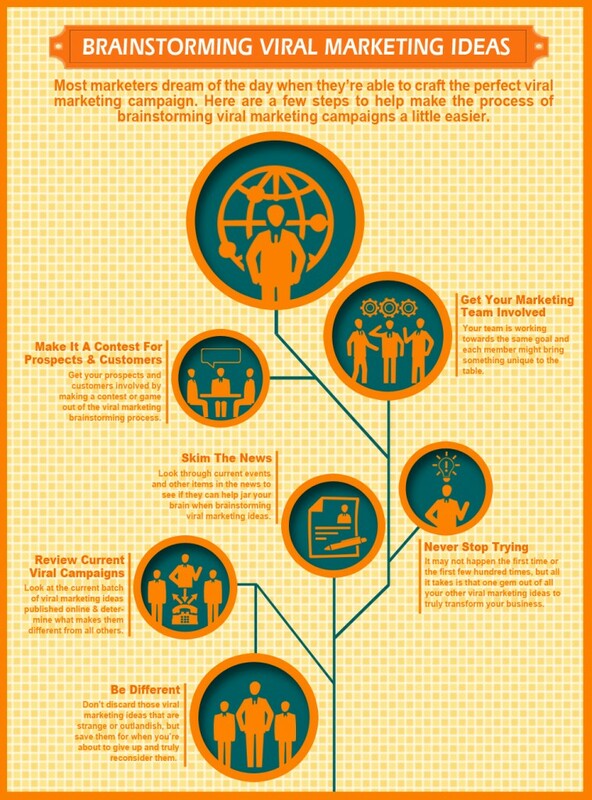 Start brainstorming now and your business just might realize the true power of viral marketing. 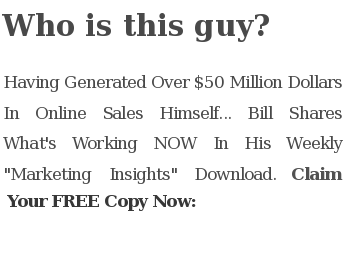 This entry was posted in Viral Marketing and tagged brainstorming viral marketing ideas, Viral Marketing, viral marketing campaigns, viral marketing ideas by Bill. Bookmark the permalink.